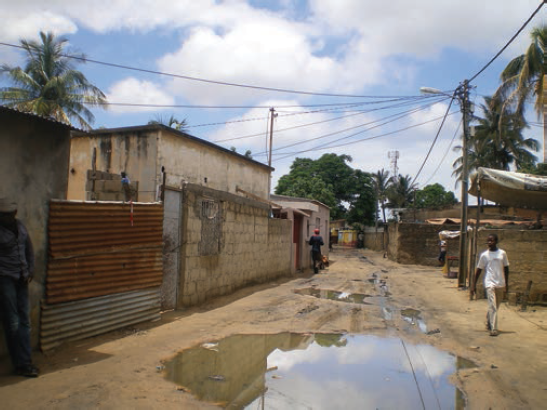 Chamanculo C is an older unplanned neighbourhood outside the 'Cement city' of Maputo. Lack of drainage causes unpaved streets to flood. Partnerships are a key strategy to build networks that can address climate change risks and initiate interventions for the sustainable use of resources. Partnerships emerge when actors with apparently different interests identify a common objective and work together towards achieving it. The planning approach, which gave communities a forum in which they could present their plans to a wider audience, created a shift away from passive participation in neighbourhood planning to active leadership and mediation. Participatory planning approaches have the potential to develop institutions for climate change governance at the local level and to establish channels of communication among different stakeholders from government, business and civil society. Local knowledge and capacity need to be recognised by local government and formal institutions. Communities may benefit from the enabling role that formal organisations play, by supporting their networks, facilitating access to knowledge and resources, and legitimising their actions. The project developed a participatory planning method to foster partnerships between public, private and civil actors. These partnerships tackled climate change through actions in the informal settlements of Chamanculo C in Maputo, Mozambique, while addressing the concerns of local citizens. The approach recognised the capacity of local citizens to develop a vision for the future of their neighbourhood in a changing climate. The coastal location of Maputo makes it vulnerable to severe climate-related risks, such as flooding, cyclones and sea level rise. Flooding, in particular, constitutes a severe threat to Maputo’s bairros (administrative subdivisions in urban districts). Water covers roads and properties, and the insufficient drainage systems, often blocked by uncontrolled waste, prolong the impact of floods. There are serious negative impacts on residents and heightened environmental risks are compounded by high vulnerabilities to these risks (UNFCCC, 2014). Vulnerability to the adverse effects of climate change therefore became a focal issue for local residents. The focus is on bringing together municipal and national government institutions and actions involved in tackling climate change, along with citizens, to jointly build strategies for climate resilience that benefit urban poor communities. A methodology called Participatory Action Plan Development was used. Expert climate analyses was introduced and made accessible to enhance the community’s contextual understanding of vulnerability factors. The co-production of knowledge helped develop potential courses of action in a joint process, linking Maputo’s community development with that of local climate change-related priorities. 4PCCD aimed to provide a platform for partnership-building for long-term collaboration between the various stakeholders involved in the project. The National Fund for the Environment of Mozambique, teamed up with UK Universities to devise a participatory planning project that could build relationships between key stakeholders. Actor mapping was used to understand the key players* who were delivering climate change interventions in Chamanculo C and Maputo. A Community Plan for Climate Change Adaptation was developed. The project facilitators provided checkpoints but the communities developed proposals, wrote the plan, presented it to other actors and made follow-up approaches to institutions for further support. This was done through a Climate Planning Committee, established to represent the Chamanculo C community. Partnerships between different institutions including governments, private sector and civil-society organisations are crucial for sustainable development in Maputo (SDG 17). Likewise, a well-designed and efficient city infrastructure is integral to ensure resilient communities, cities and urban areas (SDG 11, 13). Waste collection and recycling as well as water provision are key to maintaining good health and well-being and providing clean water and sanitation in urban areas (SDG 3, 6). Information from downscaled Global Circulation models was analysed from the UNDP Climate Change Country Profiles for Mozambique plus a city analysis by the National Disaster Management Institute (Instituto Nacional de Gestão de Calamidades, INGC) (McKinsey et al., 2012). Expert consultations complemented the information (see Castan Broto et al., 2015 for more information). The future challenge for both the National Fund for the Environment of Mozambique and local residents will be to implement project proposals. Additionally, the development of large-scale participatory planning processes for climate compatible development is resource and time-consuming. It requires the buy-in of the residents; their belief that the process will contribute to the improvement of their city and neighbourhood, and their certainty that their visions for the city’s future will be recognised and considered by city managers. Participatory planning offers methods to unpack the community’s vulnerabilities and empower them to achieve both representation and recognition of their concerns and hidden capacities. With a small amount of external support for facilitation and access to networks, community members are able to communicate their own interests and demands for climate compatible development. In this way, the Climate Planning Committee could identify key actors who could support them or who were responsible for delivering some of the proposed adaptation interventions. Having a dedicated climate change team working within the community has accelerated a process of institutional development and mobilization around climate change, as well as continuing the development of networks and funding after the project lifetime. The process showed how local residents can engage with climate change information, and how they can use climate change as a theme to foster local debate and generate partnerships around their key development concerns, particularly in relation to their safety and health. Local proposals concentrated on improving drainage and infrastructure to increase the capacity to deal with floods. Residents of Chamanculo C proposed measures to improve the bairro’s waste management and drainage through community organization, repairing networks to improve the water supply and improve waste management through a recycling centre. They also suggested the promotion of environmental education to learn about, for example, waste management and emergency responses to flooding. However, they rejected the option of relocation because they believed it would have an unbearable impact on their livelihoods. Participatory methodologies have the potential to develop institutions for climate change governance at the local level and establish channels of communication between stakeholders from government, business and civil society. In Chamanculo C community organisation was strengthened through the establishment of a Climate Planning Committee. By providing a wider forum, the participatory process has created expectations about what the communities could achieve, and local residents became confident in their perspectives. The project created a shift away from passive participation in neighbourhood planning to active leadership and mediation and as a result, the municipality has embarked on deeper climate change planning processes. Partnerships emerge when actors with apparently different interests identify a common objective and work together towards achieving it, and are key in addressing climate change risks and initiating interventions. Initiatives which build partnerships for climate change in cities help to create linkages across different types of knowledge. A key question that remains is the extent to which partnerships can deliver forms of pro-poor planning that address climate change risks in cities in Africa. How did the project engage with and elicit strategies to address climate compatible development and the concerns of poor urban communities from a wide range of stakeholders? Could the project approach be transferred to support other informal settlements suffering effects of increasing climate hazards, for example in your city? *Neighbourhood leaders were consulted to provide access to the target communities, particularly vulnerable groups. Representatives of international development agencies including UN-Habitat were enrolled. Civil society organisations with expertise in development interventions in Chamanculo C also participated. External university-based facilitators played a key role both in connecting communities with governmental and business actors and in maintaining enthusiasm across the board. *Castán Broto, V, Boyd, E., Ensor, J. (2015). Participatory urban planning for climate change adaptation in coastal cities. Localizing the climate adaptation plan and partnerships. Environmental education and provision of platforms for partnership. From these it is clear that a bottom up approach was adopted to implement the project.